If you are new to the Whole30, here are my most successful results. Here is my Whole30 book review for US News Health Eat + Run. 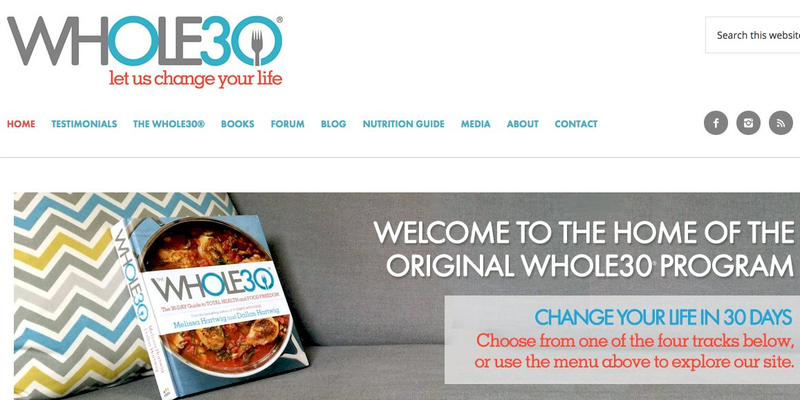 Here is my link to 30 Whole30 recipes. Our long vacation is over, the end-of-school-year chaos is behind me and I have 5 more weeks to focus on getting back on track with the cleanest-of-clean eating and my morning CrossFit classes. I love going out west every summer, but I do not love the post-vacation weight gain and food bloat. We both enjoy cooking and eating out and we definitely enjoyed a lot of pizza, ice cream, burgers, and alcohol. We rarely indulge in any of those during the rest of the year. In fact, gluten free pizza is rarely found in our house. I limit that to vacation. The last 2 days of driving home, we focus on quick food to get in the 24 hours of driving done. By the time we get home, we both were sick of food and wanted nothing but a gallon of ice water. On the long drive home, I thought about my beloved Whole30 cookbooks like Well Fed and Well Fed 2 and trying out a new cookbook, Paleo Takeout by Russ Crandall. It arrived just before we left so I’m looking forward to trying it out. I am also working on creating some new recipes since I have the time to adequately test and photograph them. The Basics: I can’t put these words any plainer. This is directly from the Program Rules Site. Sugar cravings. I have always struggled with sugar, especially after a free-for-all vacation like we just had. This is my best way to conquer it before going into a horribly hectic school year. Food reset: I just feel amazing on this program, after the initial shock to the system. My biggest struggles are full fat dairy like butter and heavy cream and sugar. I don’t really have an issue with cheese, legumes (peanuts are legumes! ), milk, excess fruit (fruit is allowed…sparingly) or non-gluten grains. I have fat-loss goals, so I’m going to really watch the fruit and carbohydrates. Mental reset: It’s part of the “fake it until you make it” plan I have going on. I’m in a rough place, lately. Vacation was the first step to recovering from..depression, basically. If I’m honest, that’s what has been going on. Sometimes, the body can go through some motions while waiting for the mind and heart to catch up. So there is my plan and the very personal reasons behind the plan. I’m one who needs structure and routine and the Whole30 definitely helps with that. Join me and a lot of other people July 13!